Flower borders: I’m so behind this year that I’m only just cutting back the dead heads on my flower borders, particularly perennial borders. All the brown, dead heads can now be removed and cut back to the base of the new growth that should be starting to come through. As we can still get some really hard frosts this month, once you have cut back, cover the border with a good layer of mulch to protect the new growth. You can use a well-rotted garden compost, although this can contain some latent seed which might come up, or wood chippings as long as they are at least one year old and not green or coniferous. Green chippings can actually take nitrogen out of the soil. The recycled council compost is also very good and cheap from your local tip; the added benefit of this is it has been sterilised so doesn’t add a weed bank to your borders. The effect of this mulch is to add a blanket of warmth to the soil and help increase worm activity and fertility. Seeds and sowing: Make sure you go through the catalogues and order your vegetable and flower seeds ready for the season ahead to get the best choice. You can also start off some seeds, both flowers and vegetables, in the greenhouse or on a sunny windowsill this month. I like to grow edible flowers along with my salad crops so plant up a few seed trays to get them going and then plant out. There are a few crops that can be sown directly into the ground in February– broad beans are one, and by doing an early planting you can get an earlier crop which often misses the blackfly problems of late June. A cloche or some fleece over the young plants is a good idea if the weather suddenly has a cold snap. I’ve also planted onions from bulbs and garlic in February – as long as the ground isn’t waterlogged, they come on fine. Soft fruit: I have two types of raspberry in my fruit garden: firstly the summer canes which need cutting back once they have finished flowering. This is done by cutting out the dead wood or the canes that have fruited. The young growth is then tied in to fruit the following year. Autumn raspberries are treated differently and it is these that are cut to the ground this month. As with the flower border, I would then recommend a good mulch over all the plants – for the fruit garden, well rotted manure is the best as the plants need a large amount of nutrients to grow, flower and fruit in one season. Garden or council compost doesn’t have enough nutrient content, in my opinion. Because I want my fruit garden to be attractive as well as productive, I plant out the small yellow primulas at the bottom of the canes, which give some early colour to the winter garden. Pruning: There are a number of shrubs that can be pruned this month, particularly those winter flowering shrubs that have just finished and are looking rather leggy. Keep in mind that you are pruning for shape – remove any crossing, dead or diseased branches and stand back regularly to see what shape you have created. Most shrubs will benefit from a prune and will flower better in the following seasons. The beauty of doing this now, particularly with deciduous shrubs, is you can see the skeleton shape before the leaves appear. Shrubs to prune now would be: Buddleia, Ceanothus and Cornus (dogwood) – cut this back hard to keep it in control and give you the lovely coloured stems in the winter – Lavatera, and winter flowering viburnums. 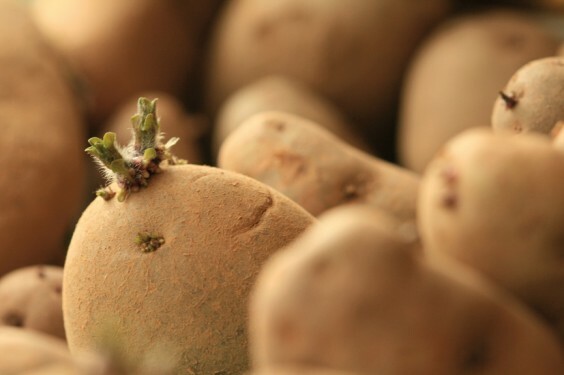 Potatoes: With so many keen gardeners in the country you will need to buy your seed potatoes this month to make sure you get the variety you want and not end up with unsold leftovers. To get the potatoes started and ready for planting out next month you can “chit” them in a warm place – this means putting them in egg boxes and allowing the eyes of the potato to grow new shoots. Potatoes are an excellent crop for breaking up new ground, so if you have taken on an allotment of new garden that needs clearing, this is the thing to plant.